When we move into a flat or apartment that isn't brand new, it's likely that the decor and design won't be our style. So what's the solution? We can customise the space that we live in! This is probably what happened in the apartment that are going to explore today! 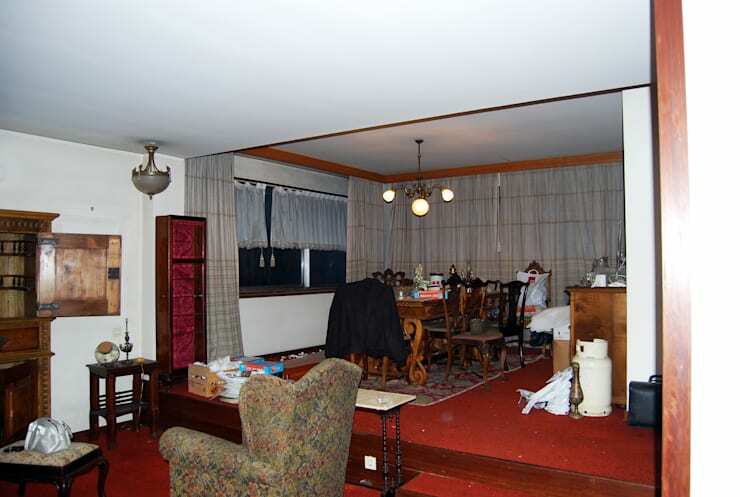 Directly inherited from the grandmother, this interior was in good condition but the style was totally obsolete and unwelcoming, despite it being very functional. An intervention was desperately needed to adapt the space to modern times! It was also necessary to rectify minor details, such as the lack of lighting. Teresa Pinto Ribeiro Architects took to the challenge and completely renovated the whole floor… let's look at the results! Located in the Portuguese town of Matasinho, what is most apparent before the renovation was the lack of light in the apartment, in terms of both natural light and artificial light. Can you also tell how old-fashioned the style of the apartment is? 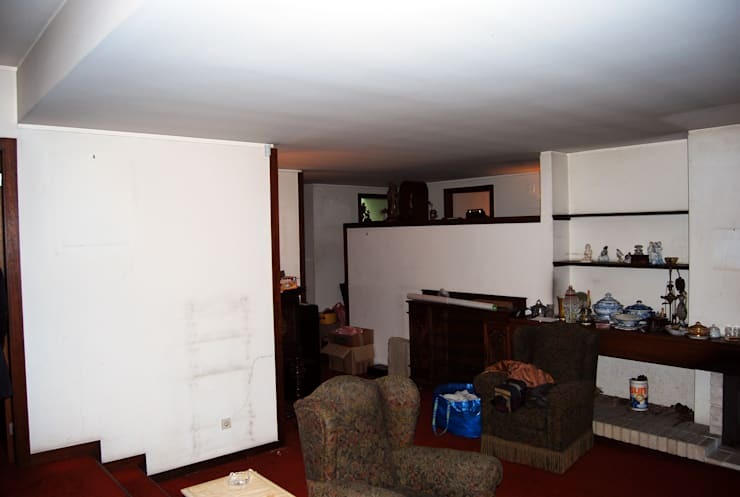 The furniture is also very dark and uninviting—it needs to be replaced. After exploring this space, we can now explain how the main objective of the renovation was to make the most of natural light as well as include brand new light installations for a more modern and trendy look and feel. After the renovation, we can see that the space has been totally reformed! New materials and new colours have been used, while the whole space now features light and warmth. Among the changes, we can see that the floor has been replaced with a more modern wood. Goodbye to the old carpet! Also included in the transformation is the ceiling, which included a new perimetre lighting system with gorgeous dimming lights. Without the old curtains, light flows into this space. Struggling with the light in your own apartment? Have a look at these: Bright ideas that can cheer up rooms without windows. In this picture, we see the same room from another point of view. The space features low ceilings and different levels. This coupled with dark living room furniture and white walls makes the room feel like it comes from a historic era. It also feels claustrophobic and crowded. This is not a home that is comfortable! Due to the unusual design of the apartment, the new furniture has been custom made. If you have the option to do this, it is a good way to solve potential limitations caused by the architectural structure of the house. This custom-made cabinet includes a television that has been installed on a grey-green colour wall, which creates a very modern effect. If you examine it closely there is wonderful attention to detail, don't you love the bricks at the base of the wall, which surround the fireplace? The living room is the centre piece of the house, which is why it defines the whole personality and style of the home. Now we are ready to go and explore the other rooms in the house and look at the different styles! 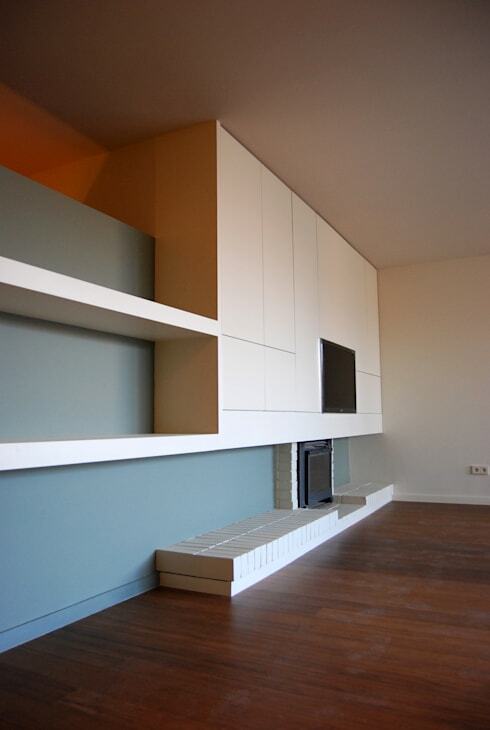 In today's design trends, it is quite normal to use innovative ways to separate spaces. It's also quite common to find that rooms are fully open-plan or in this case, slightly divided. 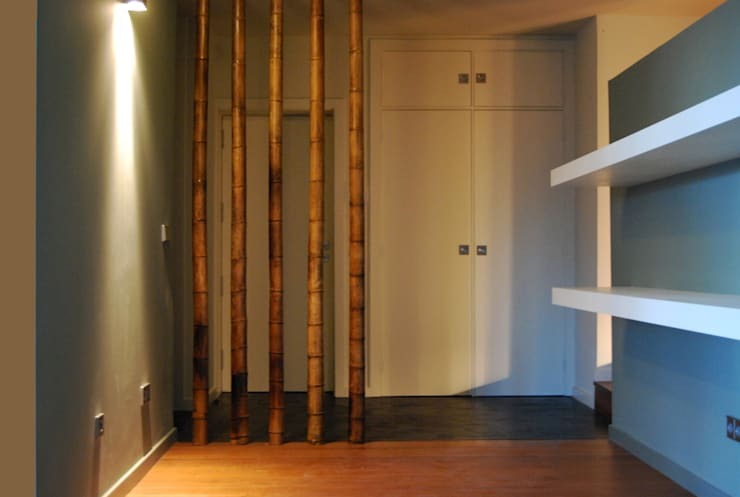 In this case, bamboo has been used to separate the entrance area of the room. This allows light to flow into the space and makes it look more spacious too. If a wall had been built here, it would have looked much smaller and darker. This is also a far more aesthetically pleasing option as well as unique and original, bringing a rustic and more earthy tone to a very modern environment. The dimensions of the kitchen required lots of stylistic devices to make it seem that much larger. 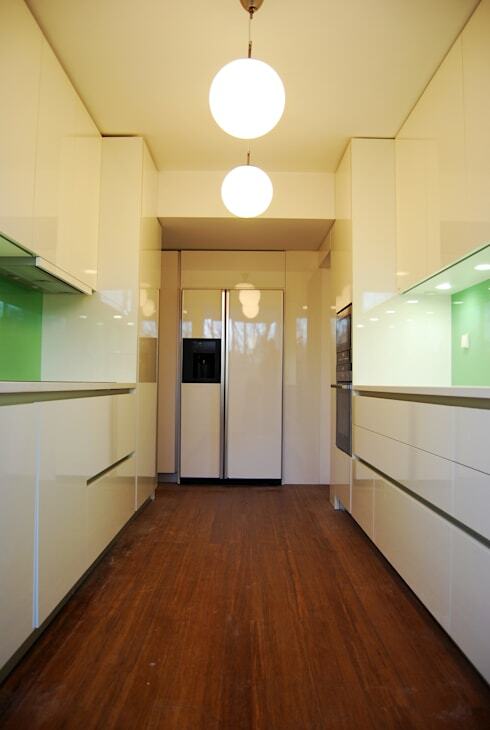 We can see that the designers have gone with white cabinets and very smooth surfaces that reflect the light. The green colour used on the walls of the kitchen breaks up the monotonous, adding a bit of life and soul to the space. The wooden floor is the final touch, making the space very warm and inviting. Have a look these other: Seriously bright ideas for kitchen lighting. Green was also the colour chosen for the bathroom. This creates a wonderful aesthetic coherence with the rest of the house. 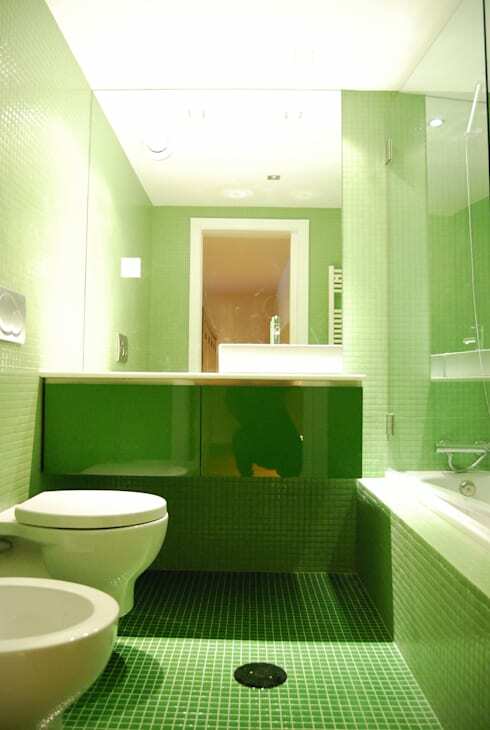 While green may be a risky choice for the bathroom, we can see that the designers have pulled it off. The result is a modern and refreshing atmosphere. 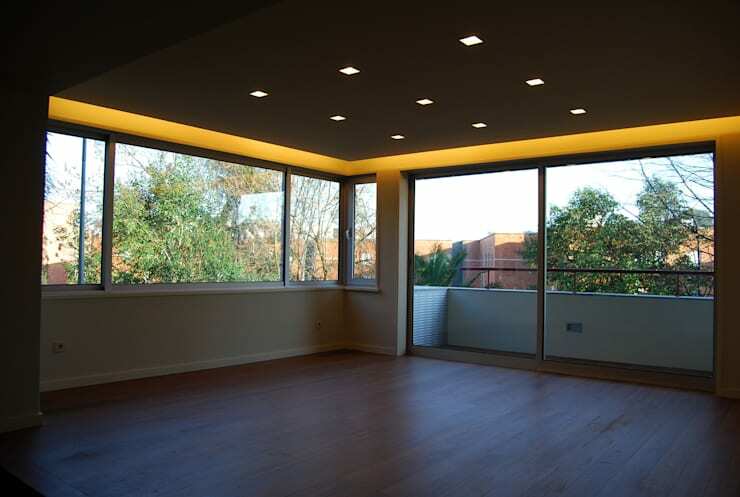 How do you achieve natural light in your apartment?